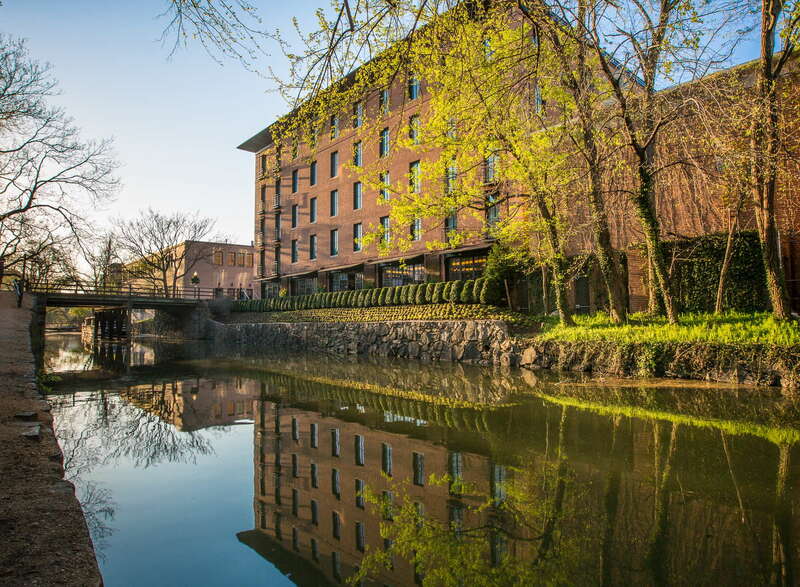 A relatively new property (it formerly was the Capella), this hidden boutique gem on the historic C&O Canal in the heart of Georgetown is the epitome of modern elegance. 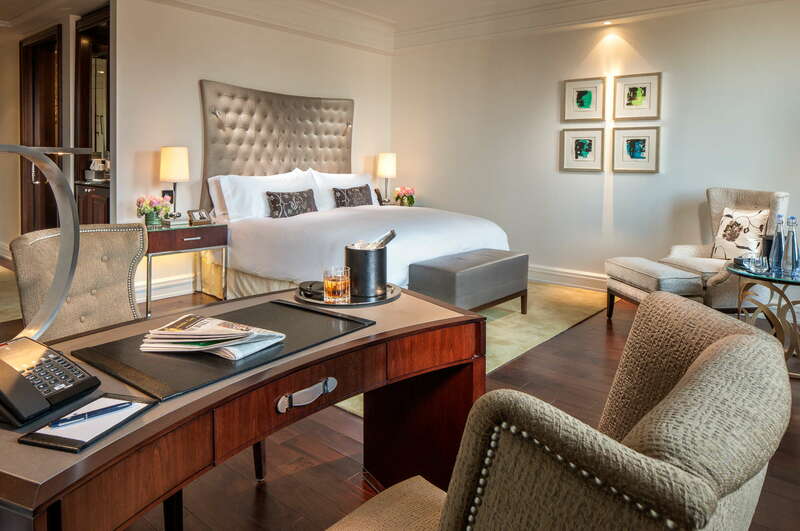 From the exquisite parquet floors (reclaimed from a French chateau) to locally inspired contemporary artwork to the sumptuous private library to the rooftop infinite pool, everything is impeccably designed … and flawless. 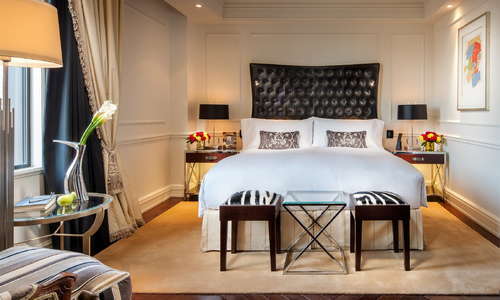 The understated rooms are soothing and posh, with some of the city’s most amazing bathrooms. 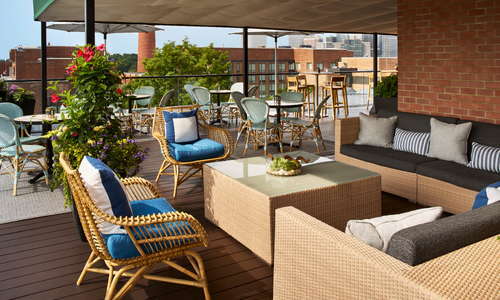 Cocktails and bites can be enjoyed in swanky interiors, along the breezy canal, or on the rooftop terrace. Oh, and did we mention the personal assistant? There’s no check-in desk, for example; your assistant will take care of everything for you. The service, needless to say, is impeccable. YOU SHOULD KNOW All this ultimate luxury comes at a price. This hotel is definitely for the traveling elite. First of all, there are 49 rooms total, with only 10 per floor, so you feel like you’re living in your own quiet space. 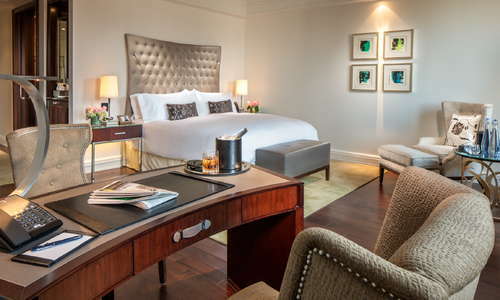 Decidedly upscale, the spacious, residential-style rooms and suites have contemporary décor with custom wood furnishings, hardwood floors, tall windows with Georgetown views, original modern artwork and a soothing neutral palette with touches of pewter and gold. Technology is state of the art (including motorized drapes that open when you enter), and all rooms have espresso machines and tea kettles. 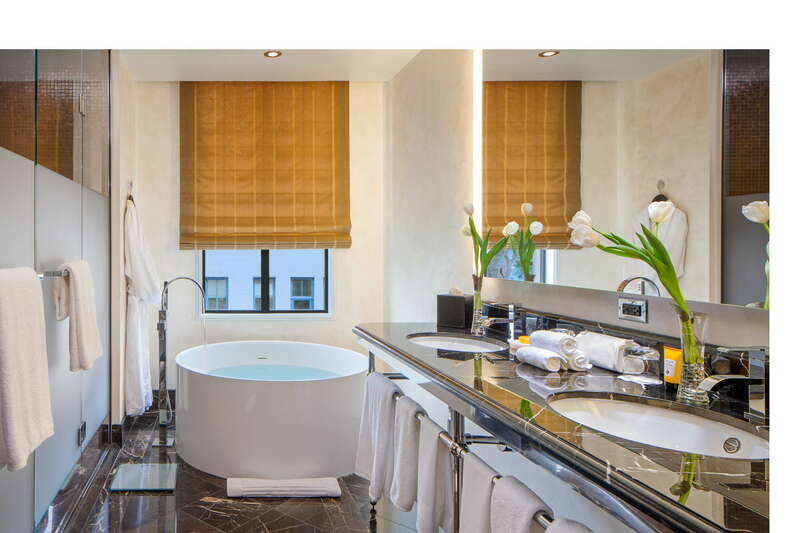 The beautiful, modern, dark marble bathrooms have glassed-enclosed, stand-up rainfall showers and/or deep soaking tubs, a double vanity, mosaic tiling and high-end La Bottega bath products. You walk into what you expect to be the lobby, except there’s no desk. It’s a beautiful entrance space, with wood paneling, marble floors, original artwork, and friendly greeters. 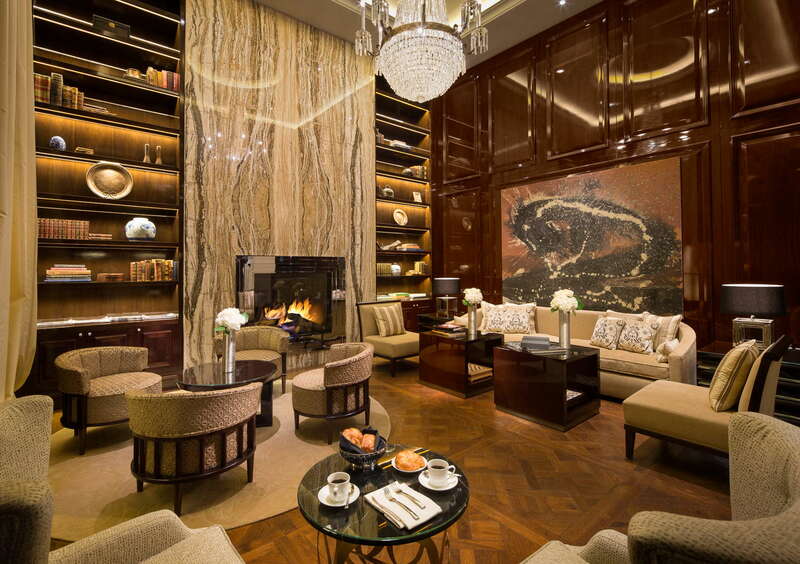 There are chairs to sit and a fireplace to keep warm. 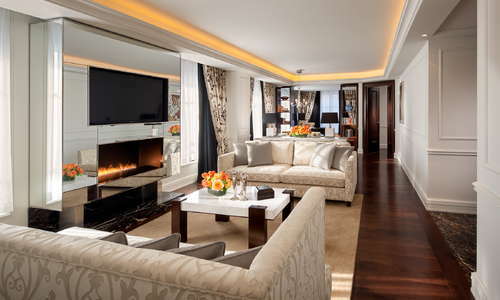 But for check in, you have a personal assistant who whisks to the split-level private living room to assist in the check-in process. 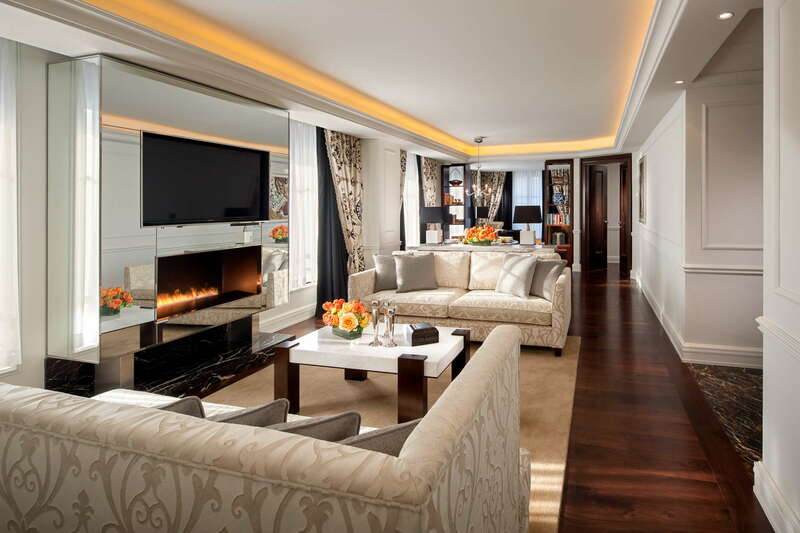 This sumptuous private room, which also can be used for reading and relaxing, centers on an onyx fireplace and sparkling chandelier (both from the Italian Embassy) and feels every bit like a (palatial) home rather than hotel. 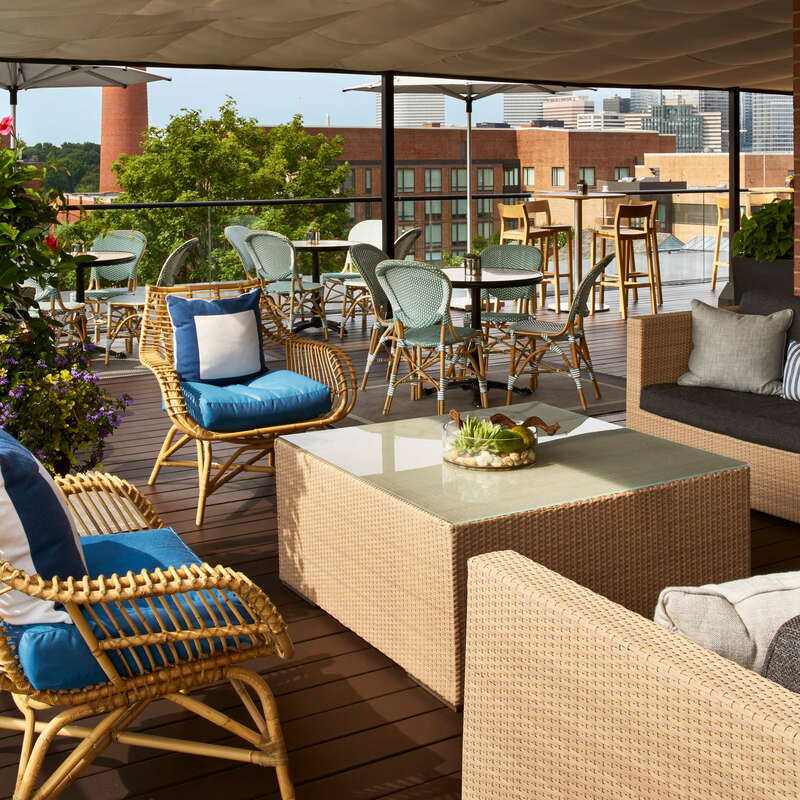 Photo: Rooftop Bar and Lounge / Rosewood Washington, D.C. The rooftop pool is actually an indoor-outdoor infinite pool that's more for cooling off and getting refreshed than swimming, and we’re perfectly fine with that. 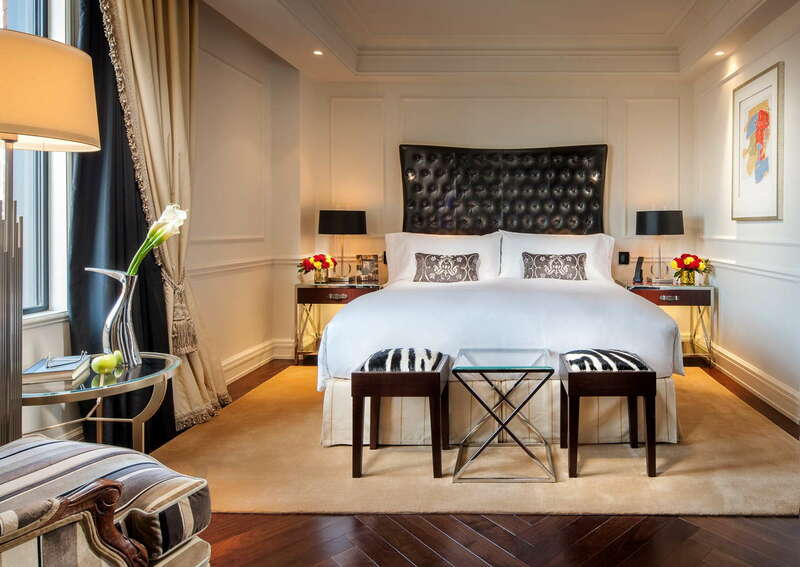 There is no spa, but in-room treatments can be arranged. The so-called gym is a miniscule, cramped space on the roof with two treadmills, a recumbent bike, dumbbells and an electronic pulley machine. The upside is that it’s glassed-in, with plenty of light and lovely views overlooking the neighborhood. There are plans to add on a yoga deck. Ask for a running map for routes along the Potomac and C&O Canal. 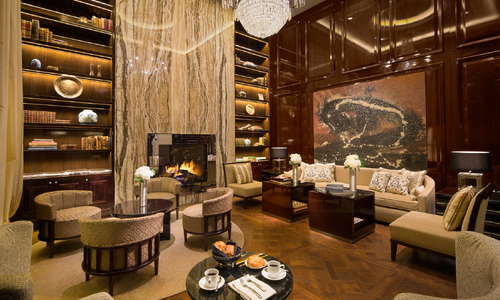 Photo: The Grill Room at Rosewood Washington, D.C. / Rosewood Washington, D.C. 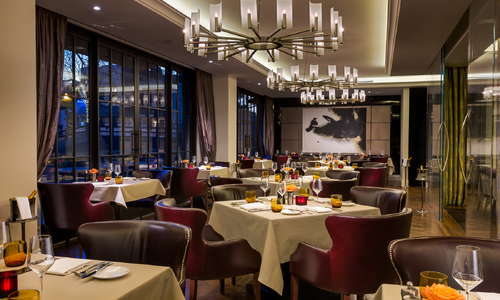 The Grill Room, with its regal marron, gold, and white decor, serves an American-style, meat-heavy, seasonal menu along with creative seafood. 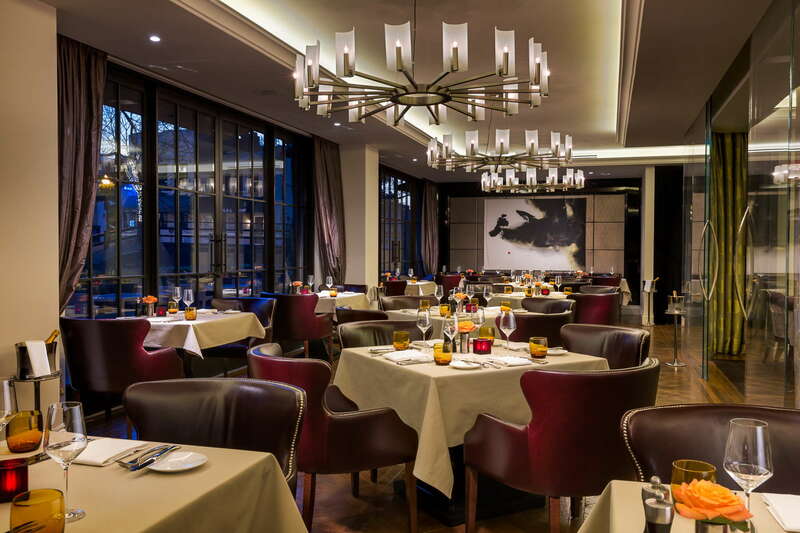 Floor-to-ceiling windows look out on the canal, which open in the warmer months for sublime indoor-outdoor dining. 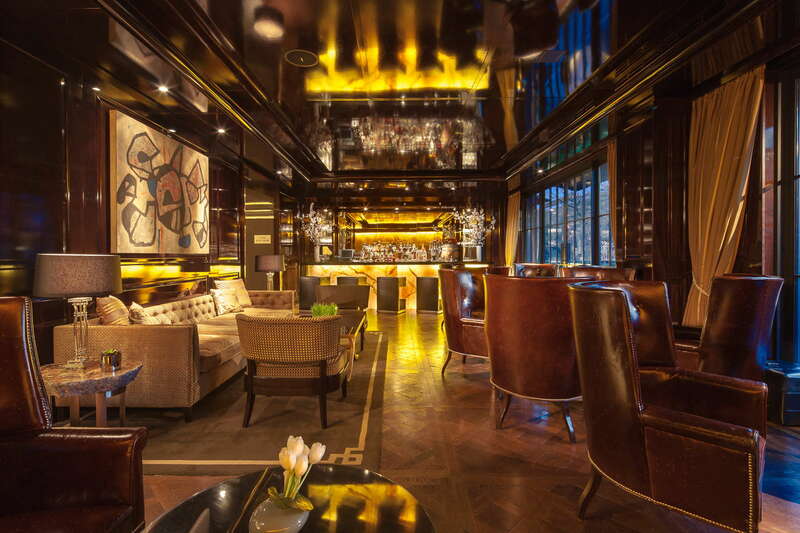 The Rye Bar is dark and intimate, with clubby leather chairs, a backlit onyx bar, and floor-to-ceiling windows looking out on the canal (the windows open in warmer weather for indoor-outdoor dining); it serves rare rye whiskeys and hand-crafted cocktails. There’s also the seasonal Rooftop Bar & Lounge with a sundeck, tables, and sofas for lounging; cocktails and light bites are served against the breathtaking backdrop of the Capital City's skyline. 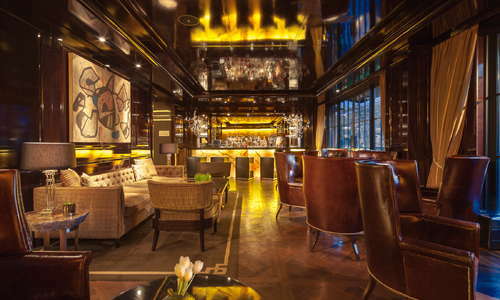 Photo: The Rye Bar at Rosewood Washington, D.C. / Rosewood Washington, D.C.
Photo: Library Lounge / Rosewood Washington, D.C. 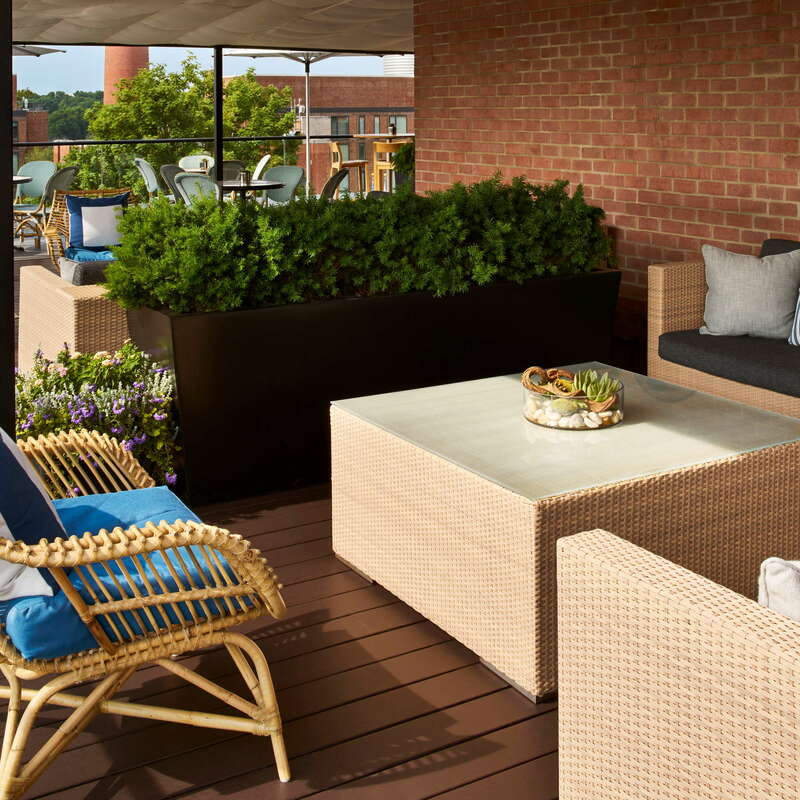 The Rosewood is located on a side street in the heart of Georgetown, with some of the city’s best shops, restaurants and bars just a short walk away. In the other direction, you’ll come to the Georgetown Waterfront, with more restaurants, overlooking the Potomac River. To travel beyond the neighborhood, you’ll need a cab. Metro is not a good option—the Foggy Bottom–GWU is a 10-block walk. DC is known for its Ethiopian cuisine, and one of the best is the award-winning Das Ethiopian (6-minute walk). Located on the Georgetown waterfront, Farmers, Fishers, Bakers (5-minute walk) offers farm-inspired American dishes in a rustic-chic setting. Enjoy wine and chocolate pairings, along with small plates, at the cozy ENO Wine Bar (6-minute walk). 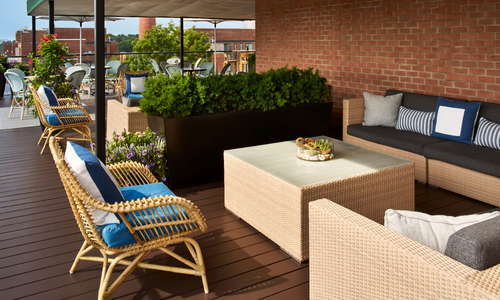 The Yard (2-minute walk) is a seasonal alfresco cocktail spot at the Ritz Georgetown, featuring specialty cocktails, live music and small bites. 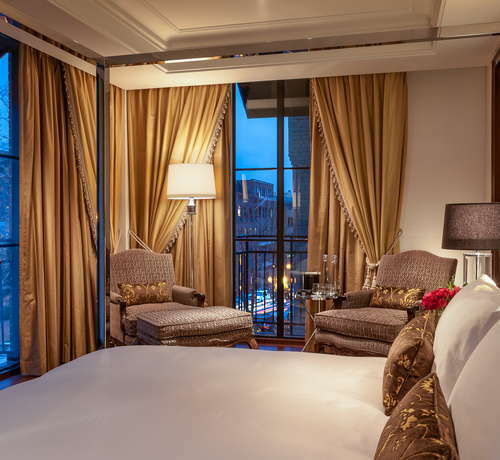 This exclusive urban retreat feels more European than American, with its understated but elegant décor, canalside setting, bespoke touches, and supreme personal service. 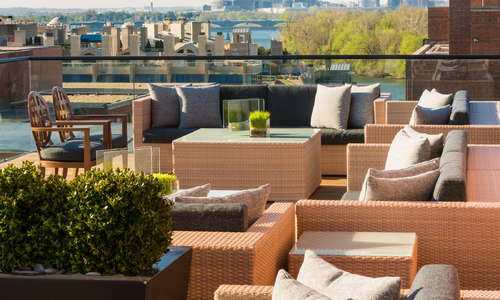 We love lounging in one of the comfy sofas on the rooftop, taking in the sunset; though sipping a cocktail along the canal is amazing as well. 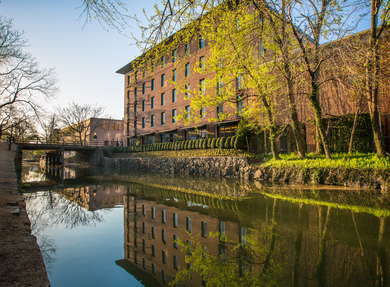 This is the only hotel in DC right on the canal, after all. 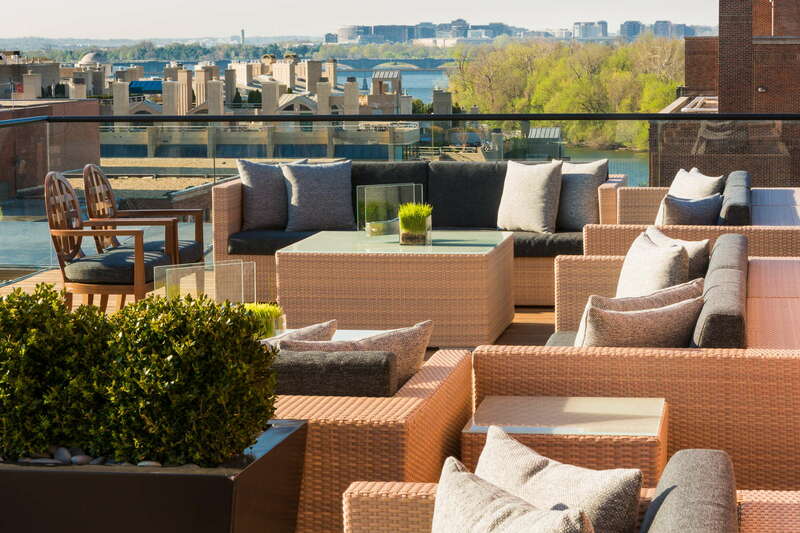 #5 The Best Exclusive Penthouse Suites in Washington D.C.
#5 The Best Hotel Rooftop Bars in Washington D.C.
#8 The Best Hotel Bars in Washington D.C.
#8 The Best Hotel Restaurants in Washington D.C.
#8 The Swankiest Hotels in Washington D.C.